Create an interesting weave pattern using only 1 block in 2 color variations. This cute piece may be used on a wall, table or even as a baby quilt. 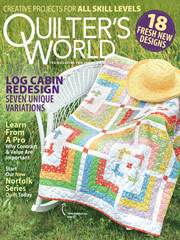 This e-pattern was originally published in Quick & Easy Quilts. Size: 36" x 36". Block Size: 6" x 6".